18 Burnhamhall Court Is A Fully Updated Detached Home On A Large Pie-Shaped Lot In Highly Sought-After Eatonville. This Home Has Been Renovated Top To Bottom W/ Open Concept Main Floor, New Custom Kitchen W/Centre Island, Handscraped Hickory Hardwood Throughout, Four Spacious Bedrooms, Bathrooms W/ Heated Floors, Finished Basement. Located On A Child-Friendly Cul-De-Sac In An Amazing School District, This Home Is Perfect For A Growing Family! Here are your by MLS Listings mapped out for you from TREB. With a great Public Library and a brand newly renovated Loblaws SuperStore at the corner of Burnhamthorpe and The East Mall and Cloverdale Mall this neighbourhoods offers super conveniences. The loss of Target from Cloverdale has left a dent in the Mall but Winners, Metro , LCBO, Kitchen Plus have taken up the slack while Sherway Gardens is undergoing a massive addition to its major chains. Find Eatonville homes for sale at Etobicokeforsale.com! 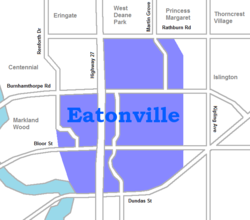 Eatonville is a neighbourhood in the Etobicoke community of the city of Toronto, Ontario, Canada. Part of a larger area known as Islington, Eatonville is bisected by Highway 427, with the community generally located north of Dundas Street West and south of Rathburn Road. Eatonville consists mainly of low density residential homes (constructed primarily in the 1950s east of Highway 427, and in the 1960s and 1970s west of Highway 427). The main arterial roads in the community, such as The West Mall, The East Mall and Burnhamthorpe Road, contain a mix of rental and condominium high-rise apartments and townhouses. There are two shopping malls in the neighbourhood, Cloverdale Mall and Honeydale Mall, as well as community retail areas along Bloor Street West and Dundas Street West. Originally, Eatonville was a 400-acre farm owned by Peter Shaver at the end of the 19th century. The farm was one of two purchased by the Eaton's department store in the 1890s (the other was in Georgetown, Ontario) to provide a reliable supply of milk for the store's lunchroom and drug store lunch counter. Eaton's donated a parcel of the farm land to the local elementary school, which was named "Eatonville School" in honour of its benefactor. Eventually, the name of the school lead to the area becoming known by the Eatonville name. The Eaton Farm supplied milk, poultry and vegetables to Eaton's until the 1950s, when it was sold and subdivided for residential development. Today, Eatonville is the home of the Etobicoke Civic Centre, which once served as the city hall of the former City of Etobicoke. The community is also home to the Eatonville branch of the Toronto Public Library, which was reconstructed in 2003 to much acclaim. The former Shaver homestead has been preserved, and was relocated to The West Mall; it now serves as a local historic museum. The Shoppes of Cloverdale Mall, the freshly renovated Loblaws Superstore with Cooking Classes and Womens Fitness Studios and the Library are all tooling up to service the multitude of Condo owners growing along Highway 427 and Dundas St West. Our closest Remax office is across from Cloverdale Mall on the East Mall. Just ask for us there and we will meet you. Here are The Toronto Life Neighbourhood Rankings .